Ankle sprains are a common injury. They usually occur when the foot is forcefully inverted or turned inward. Grade I (minor tear), Grade II (partial tear), or a Grade III (complete tear into two pieces) damage of the outer ligament complex (the anterior talofibular ligament and less often the calcaneofibular ligaments) is the result. 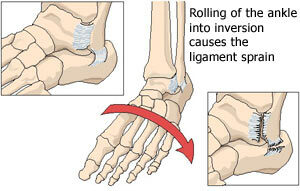 Injuries to the inner aspect of the ankle are rare and often result in a fracture before ligamentous damage occurs. Signs and symptoms of an ankle sprain include lateral ankle pain, swelling and a sense of instability. Stress X-rays may be helpful in ruling out fractures. Treatment of an acute injury requires rest, ice, compression, elevation, and bracing of the injured ankle. Early rehabilitation assists in a rapid recovery. Surgery (reconstruction of the ligaments) is only necessary when the ankle is repeatedly sprained.